This review originally appeared in the October 2003 issue (#184) of The New York Review of Science Fiction. Imagine a novel where two umbrella organizations battle for control of consumers’ hearts and minds with ubiquitous and sometimes misleading advertising. These two groups will use any method to increase sales, even if it is questionably legal. In fact, the battle between the two groups gets downright nasty at times, with corporate warfare literally taking place. The government is little more than a figurehead, its power usurped by corporations. Elements of society toward the bottom of the economic totem pole are starting to rebel, attempting to change the system. It sounds an awful lot like Frederik Pohl’s and C. M. Kornbluth’s The Space Merchants. 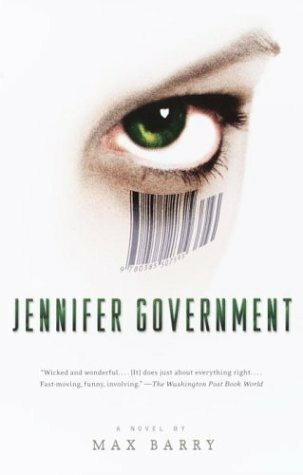 It also happens to sum up Max Barry’s Jennifer Government.